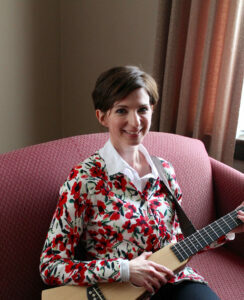 Arian Johnson has been dreaming of becoming a music therapist since she was in high school. It was during this time when she discovered her desire to use music to be of service to others. Now, with her pursuit of an undergraduate certification through SMWC’s Music Therapy Equivalency Distance (MTED) program, she is finally on her way to making her dreams come true. “I want to use dwhat I love to be able to help other people. That dream just never left me. Finally, the timing is right for it,” she said. Johnson, a resident of Springfield, Virginia, already holds an undergraduate degree in violin performance and pedagogy, but she needs the equivalency to achieve her long-term goal of earning a master’s degree and training in neurologic music therapy. “Once I have that degree, I really want to work with wounded warriors,” Johnson said. After an extensive search for the distance program that fits her current circumstances, she started MTED in the fall of 2016. She is pleased with the flexibility of the program; it allows students to complete a majority of their coursework wherever they are. In addition to helping her meet her goals, she said the program has also helped her develop as a person and as a musician. “I really, really enjoy it. The program is very thorough and I’ve learned a lot. I’ve been really impressed with the instructors and the way the program is set up. I feel like they are really going to have us well-prepared to be music therapists by the time we’re done with it,” she said. Johnson said she enjoys coming to campus in the beginning of the semester to meet her instructors and fellow students face-to-face because this enhances their online interactions throughout the semester. “I love the campus. There’s a really peaceful feeling here,” she said.